Modern life has brought many benefits to humanity as a result of discoveries in medicine and technology. These benefits would not have been possible in smaller societies, who could not afford the labour power to invest in experimentation. But do we do everything better than our ancestors who lived in tiny groups? 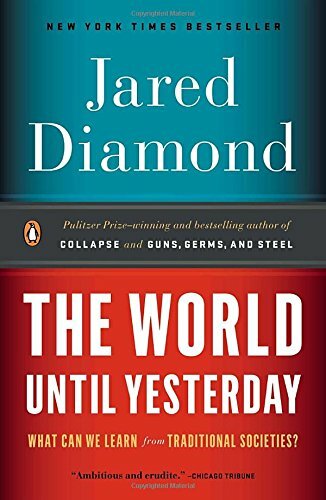 Jared Diamond thinks not. While few of us would actually go back in time to become hunters and gatherers or early agriculturalists, there are many things we can learn from traditional societies around the world. Child-rearing techniques, treatment of the elderly, risk assessment, encouraging bilingualism, and justice mediation are just some of the topics that Diamond suggests we could improve upon. He sifts through anthropological evidence from around the globe to distill possible ways to build a better world. Diamond warns that we shouldn’t overly romanticize traditional societies. Tropical ulcers, high rates of infant mortality, and inter-group violence are endemic problems that make life difficult. When given the choice, many traditional peoples choose to move to cities and towns. Why? “Rice to eat, and no more mosquitoes!” answered one group of hunters and gatherers in Papua New Guinea. Yet there are many things that we could learn from and adopt. The example of justice mediation is an interesting one. Diamond describes a conflict he was told about while in Papua New Guinea in which a school boy was run over by a truck. Rather than depend upon a cumbersome formal legal system, the families involved used mediation to come to an agreement about what had happened and what the compensation should be. But Diamond argues that compensation is the wrong word: “sori moni” (sorry money) is not about paying the price for the child’s life, but symbolizes the regret of the person deemed responsible and their recognition of the family’s grief. Our legal system, involving retracted battles in civil courts, often miss the point that neither a monetary value nor revenge can compensate for emotional suffering. Another example is child-rearing. Diamond discusses “alloparenting” among hunters and gatherers in the Kalahari desert, where an entire group of people will provide parenting to a child. He argues that this creates sociable and balanced adults who are able to understand adult life early on and relate to many different kinds of people. This kind of shared parenting could provide an antidote to the isolation of children in private homes or their almost exclusive mixing with children of their own age. This example reminded me of the work of anthropologist Sarah Blaffer Hrdy, who warns that isolating children impedes their social skills, and that given enough time, we run the risk of losing the genes that cause us to be sociable people, leading to a world of sociopaths. Just as not all traditional practices are good for the modern world, nor are all modern advancements good for traditional societies. Diamond relates a case of farmers in Mexico who practiced what seemed like very inefficient farming methods. Rather than have all of their land in one place, they would have tiny plots scattered for miles around, and would spend most of their days walking from one place to another. This loss of productive time meant that yields were kept permanently low. But as it turns out, these farmers had very good reasons for doing so. A high rate of crop failure meant that scattering their fields across different kinds of environments would mean that in any given year, at least some of their crops would produce, and families would avoid starvation. Modern methods are not a blanket solution that can be applied in all cases. Human societies have always been very diverse, and while we might marvel at how hunter-gatherers in the Kalahari desert share parenting responsibilities, we would be horrified at how some tribes in Papua New Guinea allow their children to run risks of physical harm (such as playing with knives or near a fire) that would be neglectful in most countries today. The point,then, is to adopt context-specific solutions, whether they come from traditional societies or modern ones. This requires us to stop making assumptions about what is good or bad in the first place, and instead ask if we can do things better.